Overview: What is skin cancer? Skin cancer results from cells that multiply out of control. As a result, tumours, lumps, or masses can sometimes form on normal skin, and can be either benign (non-cancerous) or malignant (cancerous). 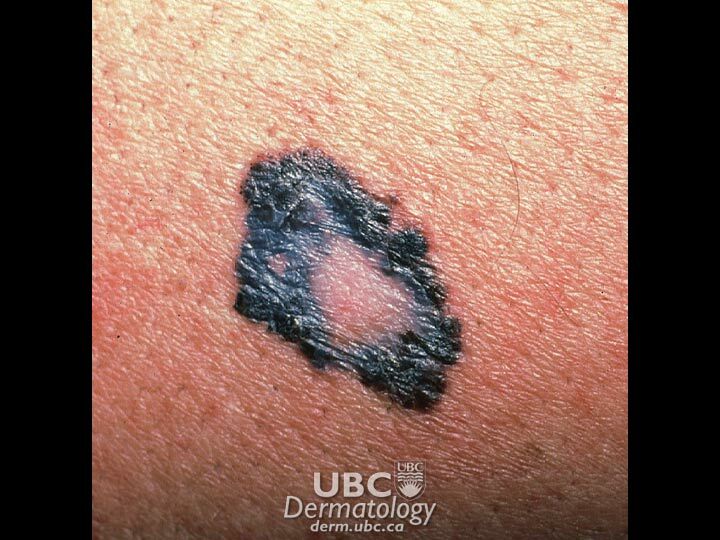 Skin cancers are generally categorized as non-melanoma skin cancers (basal cell and squamous cell cancers) and melanoma. The difference among the three is the type of cells that the cancer affects. In the case of non-melanoma skin cancers (i.e., basal cell carcinoma and squamous cell carcinoma), the cell affected is the keratinocyte. In human skin, this cell starts out at the basal layer (the lowest layer of the epidermis) and then moves up to the squamous (or middle ) layer of our skin. The non-melanoma cancers derive their names from where in the epidermis the affected keratinocyte is located. Keratinocytes are the most common cell in the epidermis, the outermost layer of skin. These cells produce keratin, a tough, highly fibrous protein that acts as a barrier in our skin to provide waterproofing and prevent injury and invasion from microbes. This protein is also found in our hair, nails and tooth enamel. You are more likely to develop a non-melanoma cancer if you have a family history of skin cancer, have already had skin cancer, or have fair or freckled skin, blue eyes and light-coloured or reddish hair. However, anyone who has had excessive sun exposure, severe and frequent sunburns during childhood, or lives in a sunny or high-altitude climate is at increased risk of developing skin cancer. Those who use immunosuppression drugs following an organ transplant, and other patients with suppressed or weakened immune systems are also at higher risk of non-melanoma cancer. Although you can’t change some of these risk factors, some ways to reduce your risk include decreasing sun exposure, using sunscreen or long-sleeved clothing, avoiding sunburns, having regular skin check-ups, and avoiding tanning lamps and beds. One of the primary causes of the DNA damage that leads to skin cancer is exposure to ultraviolet (UV) radiation from the sun and tanning lamps. However, genetic predisposition also plays a part. In fact, researchers have identified several genes that are linked to skin cancer. The "patched" (PTCH) gene often changes in basal cell carcinomas, while the p53 gene sometimes mutates in squamous cell cancers. While likely not the only genes associated with these carcinomas, they do give researchers some new clues in understanding these diseases. Basal cell carcinoma: Most basal cell carcinomas are caused by exposing unprotected skin to the ultraviolet (UV) radiation in sunlight. The UV radiation damages genes that regulate cell growth and division. One gene commonly found to mutate (change) in basal cell cancers is the “patched” (PTCH) gene. Changes in this tumour-suppressor gene, which normally helps keep cell growth in check, can allow cells to grow uncontrollably. PTCH is unlikely to be the only gene that plays a role in the development of this skin cancer. Researchers are still working to fully understand the cause. Nevoid basal cell carcinoma syndrome: This rare genetic condition is also known as Gorlin syndrome, or basal cell nevus syndrome. It is characterized by numerous basal cell carcinomas of the skin as well as jaw cysts seen on xray, palmar and plantar pits, calcified folds of the brain seen by radiography, hamartomas, various noncancerous growths, and skeletal anomalies affecting the ribs, hands and face. Annual magnetic resonance imaging (MRI) for infants and children with the syndrome for medulloblastoma screening should be performed until the age of eight years. An annual X-ray of the jaws is recommended to appropriately diagnose and manage cysts. Squamous cell carcinomas: Most squamous cell carcinoma is caused by exposure of unprotected skin to ultraviolet (UV) radiation. 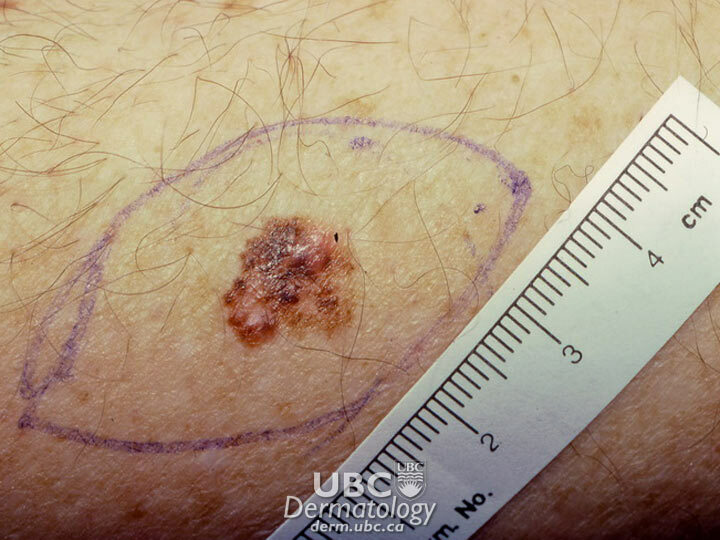 Repeated, unprotected exposure to UV light, especially in the few years previous to diagnosis, increases the risk of developing squamous cell carcinoma. The UV radiation damages genes that regulate cell growth and division. People with weak immune systems are also at greater risk of developing squamous cell cancers. The gene commonly found to mutate in squamous cell cancers is called p53. Changes in this gene, which normally causes cells to die, may cause abnormal cells to live longer and perhaps become cancerous. Gene p53 is unlikely to be the only factor in the development of skin cancer. Researchers are still working to fully understand the cause. Actinic keratosis (AK): This condition consists of one or more pre-cancerous skin lesions (pre-malignant). 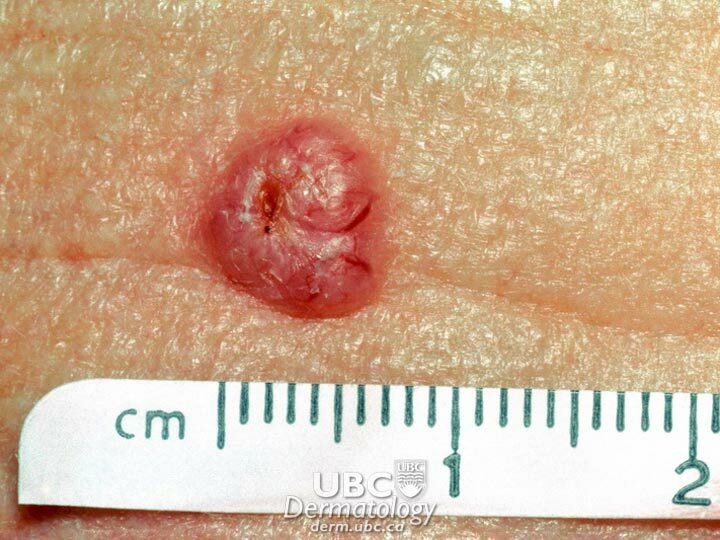 Thought not a cancer, some researchers believe it is an early form of squamous cell carcinoma. Only a small percentage of actinic keratoses go on to become squamous cell carcinoma. The lesions are strongly associated with UV exposure and sun damage. (The words literally mean “sun-induced rough spots.”) Risk factors include being over the age of 40, exposure to high levels of UV radiation, and a weak immune system. Non-melanoma cancer statistics are not well documented since many cases are successfully treated in a doctor’s office and are not reported. In fact, most provincial cancer registries do not require doctors to count non-melanoma cancers. Basal cell carcinoma comprises 80 per cent of non-melanoma cancers. Basal cell carcinoma can recur in the same or other places on the skin. Within 5 years of diagnosis, 35-50 per cent of patients develop a new skin cancer. Squamous cell carcinoma comprises 20 per cent of non-melanoma cancers. Actinic keratosis is one of the most commonly treated conditions by dermatologists. Only a small percentage of cases of Actinic Keratoses can become skin cancer. Some cases go away on their own. In Canada, 74,100 new cases of non-melanoma cancers are estimated for this year; of these, 264 will likely be fatal. In the United States, approximately 1 million cases of non-melanoma cancer are diagnosed each year; of these, about 2000 result in death.